This short but substantial paragraph taken from the catechism of the Catholic Church gives us abundant food for thought to masticate and digest as the Church celebrates the Baptism of Jesus, concluding the Christmas season of joy! The Liturgical celebration of the Baptism of Our Lord and Savior Jesus Christ should prompt us and motivate us to review our own Baptism, its meaning as well as its obligation for us. 1. 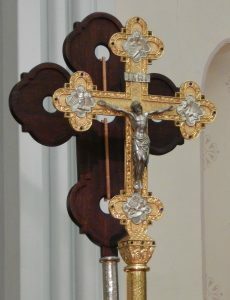 SIGN OF THE CROSS. One of the most noteworthy signs of belonging to the Christian-Catholic faith is the Sign of the Cross. Every time we make the sign of the cross we profess our belief in the Mystery of the Blessed Trinity—- One God in three separate and distinct Persons: the Father, the Son, and the Holy Spirit. This should be a brief moment when we call to mind our own Baptism and the dignity that flows from that sacred moment. As the Baptismal waters trickled off our forehead and the words of Baptism were pronounced by the priest or deacon, gifts in abundance descended into our souls. We became a son of God, brother to Jesus Christ and friend to the Holy Spirit. For this reason Pope St. Leo the Great exhorts us: “Christians recognize your dignity.” It all started at the moment of Baptism! 2. YOUR BAPTISMAL DATE. If you do not know the specific date of your Baptism or the dates of the Baptisms of your children, why not look it up this week. Celebrate! As human persons we are called to celebrate! Wedding anniversaries, birthdays, Holidays—all are moments to celebrate. Why not add a new category? Baptism dates! As a catechetical tool parents can surely catechize their children by calling to mind their child’s baptism in the context of a celebration. Why not buy a cake and candles. However, go beyond the eating and singing. Explain to the child the “why” of this celebration! This was your second birthday. You were born of water and the spirit on the day of your baptism. You became a child of God; you entered into a new family, the Church, the People of God! 5. MISSIONARY CALL AND SUMMONS. Before ascending into heaven Jesus gave to the Apostles as well as to us our marching orders, our mission, our task to carry out. Read slowly and meditate on Jesus’ last words: “All power in heaven and on earth has been given to me. Go, therefore, and make disciples of all the nations, baptizing them in the name of the Father, and of the Son and of the Holy Spirit, teaching them to observe all that I commanded you. And behold I am with you always, until the end of the age.”(Mt. 28:18-20). The message! It could not be clearer! Jesus summons all the baptized to bring the grace of their own baptism to the entire world. The grace of God, the presence of the Trinity is not meant to be hidden under the bushel-basket but to shine and to be shared with the entire world! Let us conclude by listening to the consoling words of Pope Benedict XVI: “Through Baptism each child is inserted into a gathering of friends who never abandon him in life or in death…This group of friends, this family of God, into which the child is now admitted, will always accompany him, even on days of suffering and in life’s dark nights; it will give him consolation, comfort and light.” (Pope Benedict XVI, January 8, 2006—taken from the “YOU-CAT # 193) With these words from the Holy Father and practical advice, let us strive to live out our Baptism to the fullest extent possible—to become shining stars of holiness, reflecting the Light of Christ! « Previous Post: FAMILY: TEN STEPS TO FORM GOOD FAMILIES!